You may be able to find a couples animation or couples AO that allows this. I know there are couples AO's that allow carrying in various ways, so I'd look around and see if there's one for sitting on the shoulder. Good luck! You can't sit on an attached prim. The "shoulder sitter" is a two person animation, like a hugger attachment. The second person isn't really sitting on you, though they act like it until the animation is released. All the saddles and the like I have seen for dragon and centaur and horse and wolf avatars that allow someone else to ride your avatar are a vehicle script, with custom animations for the avatar type. So you would need to make a vehicle that has sit poses on the various riding spits, plus an atachment point for you to sit on first. That vehicle would have to animate your avatar the same way you do for normal movement when walking, running, flying or swimming. Once you sit on the vehicle, your friends could then sit on your shoulders and the base of your tail or on top of your head, and ride along. A worn item can, however, be scripted to produce a vehicle that you can easily sit on to effect this change. So you could have a chat command or a HUD that could spawn the vehicle for you as needed. 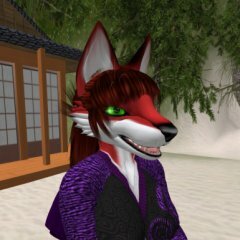 One of my wolf avatars has a choice of two 'saddles'. One has the wolf in control of movement, and with the other, the wolf's rider can control where the wolf and rider go. You can't do that. There's no way to sit on an attachment. You can both sit on the same object and you can control the object to make it move, however. Some of those systems are very convincing. This is an awesome answer....I was looking for some time the solution for my problem.I built a Bento quadruped avatar and need to make a saddle for another rider....so...ty. Is there any way you paste here the code for this vehicle? i would appreciate. There are generic vehicle scripts in many script libraries, but virtually any specific vehicle that you create needs to have a script that is customized to that vehicle. If you are new to writing this sort of script, you should find the Linden Vehicle Tutorial helpful. If you are not a scripter yourself, you may post in the InWorld Employment forum to attract the attention of a scripter to write something for you. I have a dragon avatar with similar options, it allows me to carry them by my claws while I fly or they can ride on my back and fly me. So something similar to that is probably what the poster needs to find and use if they wanted to go that far allowing someone else to control them. else just a simple vehicle script and animation would work allowing others to just ride on them.